It was with some anticipation that I picked up a copy of the Cornersmith recipe book. Not only a local Marrickville cafe, but one renowned for pickles and preserves. My first project out of the book was making our own seeded mustard, which turned out to be delightfully simple (as well as delightfully tasty!). The starting point is generous pile of whole mustard seeds (yellow and brown), which can be obtained very cheaply from your local Chinese or Indian supermarket. To this is added honey (our own, of course! ), plus vinegar, and some extra flavourings. The majority of the mustard seeds are ground down to a paste, using a coffee grinder. The whole seeds are then added back in for texture. Once everything is combined with the vinegar, it’s left in the fridge for a month, allowing the flavours to infuse together. Then into jars. The result is every bit as good as the store-bought, for a fraction of the price. This entry was posted in Cooking, Making our own and tagged marrickville, mustard. 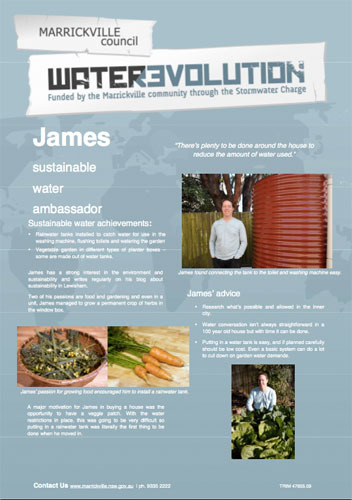 The Water Sustainable Urban Development (WSUD) tour was organised by the “water revolution” staff at Marrickville Council. Not knowing what to expect, I was pleasantly surprised. It was hard to tell who were more passionate, the householders installing the water tanks, or the folks on the tour! The first stop was Graeme’s house in Marrickville. This showcases a significant project (8 months in length) to install a pair of 5,000L water tanks at the bottom of their large, and heavily sloping, garden. The tanks were then plumbed into the house, for absolutely everything other than drinking water. The cost was actually pretty reasonable, and the duration of the work was I think due to Graeme doing a lot of the work himself, presumably on weekends. Something I hadn’t seen before was the pressure accumulator tank. About the size of a gas bottle, this holds water at pressure. This means that if a small amount of water is required in the house (washing hands, etc), the water is drawn from this holding tank, without the pump having to come on. This reduces the electricity required, and presumably helps to prolong the life of the pump. I’ll definitely have to look into this for our house. The Hill Street rain garden was extremely interesting. This takes the normal storm water that runs of the street, and passes it through this mini wetland. The goal is not to store the water, but to filter it through the plants, which are grown on top of several layers of sub-surface material. The end result is cleaner water going into the waterways, with a lot of the sediment, rubbish and nitrogen stripped out. I think it also makes for an interesting take on street-side gardens. Would love to see more of these go in throughout the Inner West. John Caley, who ran the water course I attended some months back, had a house that certainly met expectations. Plenty of careful design of water tanks, and a nice use of water off next door’s roof (with their permission!). What took my fancy, however, was their lovely little communal garden in the small laneway beside the house. Plenty of produce to share amongst the neighbouring houses. Mike and Jen’s house had everything that an inner-city greenie would want. Water tanks, careful management of water runoff, and chooks. Oh, and a nice vegetable garden squeezed into their small back garden. Thanks to Maggie for organising the day! Visit the Marrickville Council water pages to find out more on future events, and how to get involved. This entry was posted in Growing our own food, Local issues, Saving the environment and tagged lewisham, marrickville, newtown, rain garden, sustainability, water tanks, wsud. There are a number of community gardens in the Inner West of Sydney (and many more beyond). These provide a great opportunity for those with small gardens (or no gardens!) to grow their own vegetables, herbs and fruit. Today we visited the Marrickville Food Forrest, located on Addison Road, in the Addison Road Centre (ARC). As is typical, it is squeezed into an unused plot of land behind some buildings, but thriving nonetheless. It makes me appreciate how lucky we are here. We have easily 5 to 6 times the space of a typical community garden plot, with plenty of sun, and room for growth. Now the pressure is on to really make it thrive! Over the next few months we’ll try to drop into more of these gardens, to get further inspiration on what (and how) to grow. There is also the potential to join up with a Seed Savers group, to swap seeds (we have plenty left over). This entry was posted in Useful resources and tagged community gardens, gardens, glebe, lilyfield, marrickville, newtown, petersham, redfern, rozelle.